Our new Transparent Custom Tokens are available with any full color print you choose on the tokens. Customized Transparent Plastic Tokens come in four circle sizes and also in a rectangle shape. The minimum order is 1,000 Translucent Plastic Tokens, and production time is about four weeks. Transparent Custom Printed Plastic Tokens are unique among drink tokens. Unlike regular Plastic Drink Tokens that are made on opaque plastic with a one-color imprint, these Customized Tokens are transparent and they feature any full color design you choose on them. Token recipients will love receiving and using these stylish Translucent Plastic Tokens. Custom Printed Transparent Plastic Tokens can be used by an organization for all sorts of uses. 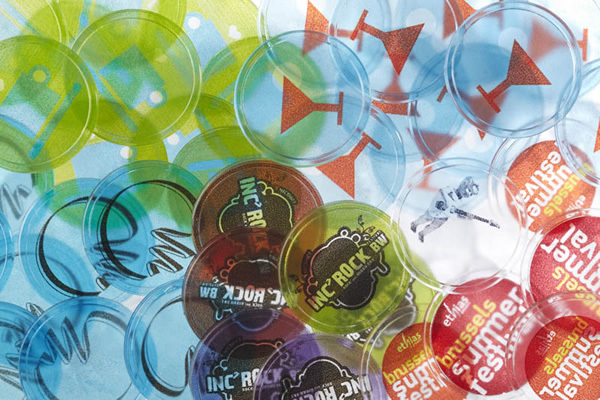 Customized Transparent Tokens are great for Restaurants, Blubs/Bars, Special Events, Tradeshows, Incentive Programs, Carnivals, Festivals, Promotions, and much more. 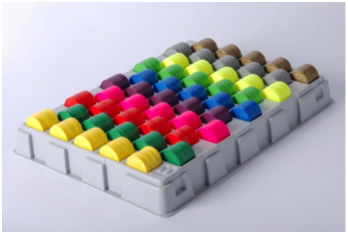 Plastic Token Counting/Storage Trays are also available! Choose from two types of counting trays: 1) one for 0.91'', 0.98'', and 1.14'' round tokens and 2) one for the 1.37'', 1.5'' round, and 1.2" hexagonal tokens. The trays for 0.91'', 0.98'', and 1.14'' tokens are gray. The trays are white for our 1.37'', 1.5'', and hexagonal tokens. NOTE: These trays are only available for the following types of Plastic Tokens: Full Color Tokens, Molded Plastic Tokens, and Transparent Plastic Tokens. For FREE Token Samples or additional information on our Custom Transparent Plastic Tokens, or any of our other Custom Plastic Tokens, please contact us at 1-800-233-0828.